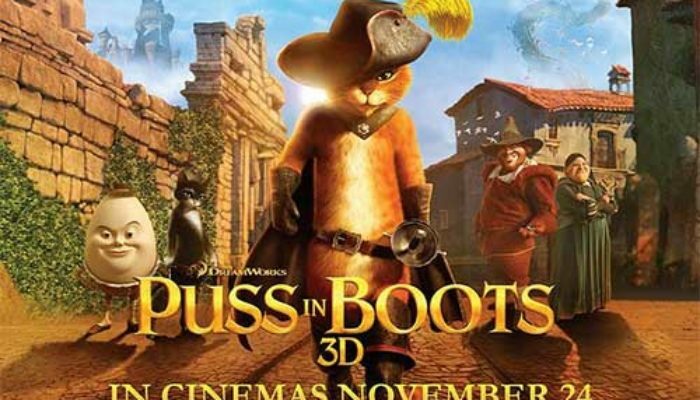 REVIEW (GRADE: B-) If Puss In Boots seems like a money-grabbing attempt to capitalize on the successful (if out-of-steam) Shrek franchise, it is. But for an unnecessary spin-off featuring a former supporting character, it's actually pretty good. Though the character, who is essentially an animated version of Banderas' own Zorro portrayal, is not as fresh and funny as he was in his debut in Shrek 2 (the film that series should have ended on), he still maintains sufficient charm and charisma to make for an enjoyable kids' movie that won't have parents checking their watches. He also has a nice chemistry with new characters Kitty Southpaws (voiced by Salma Hayek) and Humpty Dumpty (Zach Galifianakis). As always, the Dreamworks Animation writers have some fun remixing fairy tale mythology and characters, but in every other respect the film represents a par-for-the-course effort from the studio (read: good but not great). The music seems like a B-grade copy of James Horner's magnificent score from The Mask of Zorro. The animation and story are enjoyable, but hardly aspire to the artistic heights of How to Train Your Dragon and Kung Fu Panda 2 (two of Dreamwork's more standout efforts). Neither does the film have the belly laughs of the first two Shrek films; it simply had me, and the audience I saw it with, smiling throughout and chuckling here and there. Puss In Boots may be worth a trip to the theater if you have little ones: they'll have a ball, and you won't regret it. However, you also won't regret waiting for Redbox or Netflix. CONTENT OVERVIEW: Puss In Boots is rated PG. It contains action violence in the form of sword-fighting, hitting, and gun/cannon fire. Like the Shrek films it spun off from, there are a handful of fairly adult innuendos meant to go unnoticed by children as well as some mild language. MESSAGES TO DISCUSS: There is no greater love than to be willing to die for one's friends. Stealing is wrong and protecting the innocent is heroic. A change of heart is possible through true repentance.